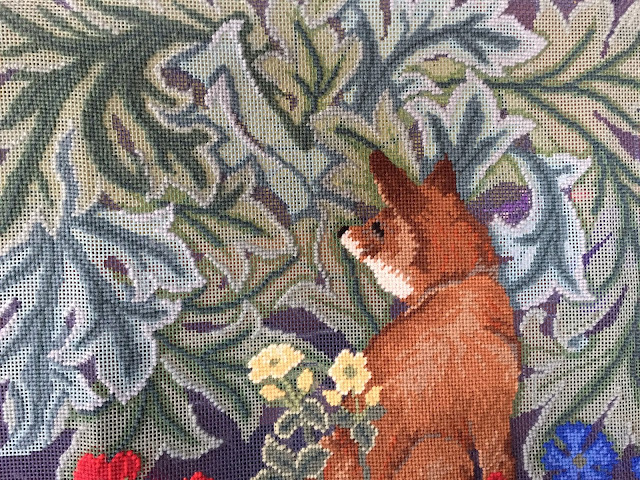 I should have known ... after the whirlwind of the foreground flowers and the fox, the leaves would be a big challenge. 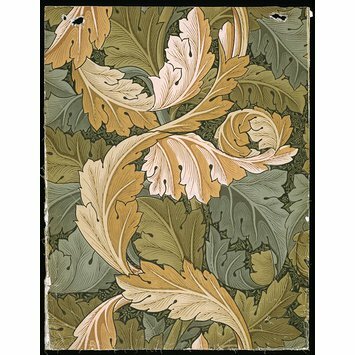 I am a huge fan of the acanthus, which always seems to me to be the ultimate William Morris plant. Years ago when I walked the Thames Path I stopped in at Kelmscott Manor and was thrilled to see acanthus growing in Morris's garden. 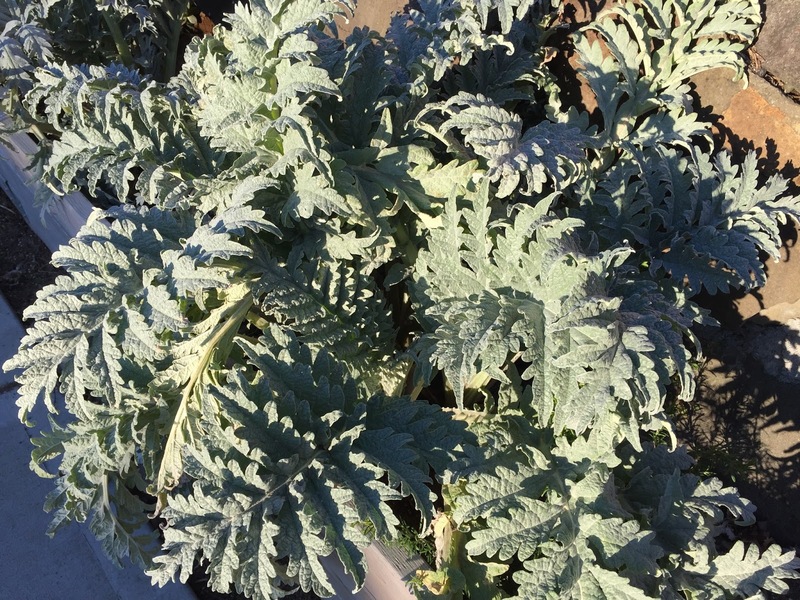 Every time I see them growing I always think I should plant some in our garden, too. Clearly they grow well in Ballard! Morris's designs were always subtle, stylised evocations of natural forms rather than literal transcriptions. He warned in his essay 'The Lesser Arts' (1877) against the likes of "sham-real boughs and flowers", and advised those designing wallpapers "to avoid falling into the trap of trying to make your paper look as if it were painted by hand". With a natural eye for pattern, Morris produced papers that not only balanced figuration and order, but which were (unusually for the time) distinctive. 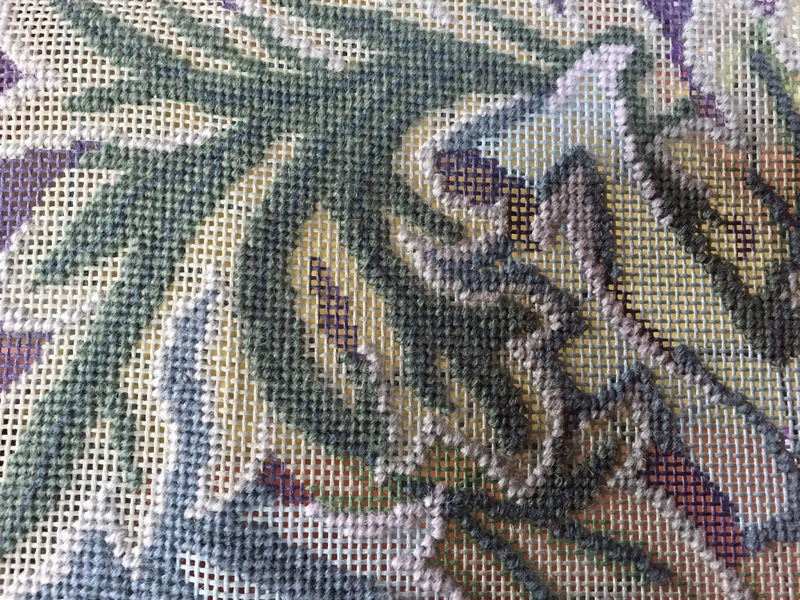 I think stitching the pattern really makes me look at the way the leaves are shaped, how they curl back against each other. They're so beautiful... though it has taken me a lot longer than I expected to get through them! I started with the veins, and then stitched the pale green edging, and then the pale blue edging. I originally thought I would get the green leaves done, but instead did the dark shading on the blue leaves. I finished that this week, and just started the dark shading on the green leaves. We're also welcoming two new members -- somehow I missed them, so apologies for the late addition! Welcome Hayley and Tony! 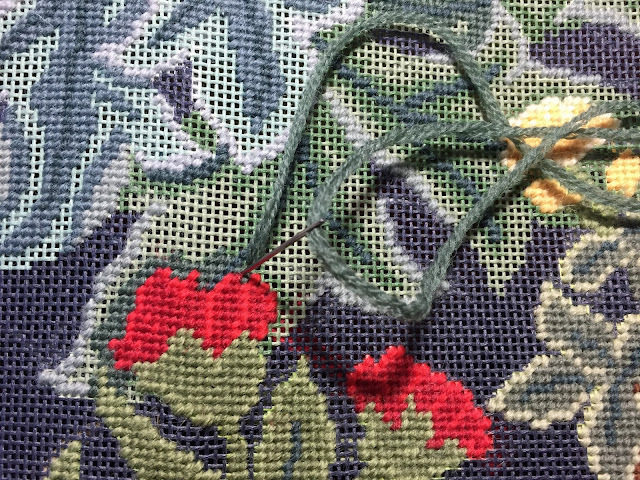 Our next stitch-a-long check-in is in three weeks; I really to have the green leaves fully stitched by then. This looks like a lot of fun to work on, especially since the canvas is painted so you don't have to look at a chart. 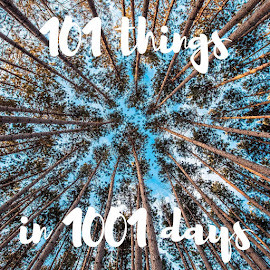 You're doing great so far, keep it up! I love how William Morris' designs always translate well into all media, and this is no exception. They're subtle and rich, but also crisp and graphic. Nice work! Do you know, I've seen acanthus leaves in various designs (Wm. Morris, architecture, etc.) for decades but it never occurred to me to look into the plant as a botanical specimen! I'm going to have to do that now, and see whether we can grow any where we live. ;-) Meanwhile, great progress on your leaves! It is looking great. The leave are so beautiful. The shading on these leaves reminds me of the crewel embroidery on Norwegian bunads. They also have that layered effect with the dark to light threads. It really works to bring the foliage to life. Great progress for you, this is going to be a beautiful piece. 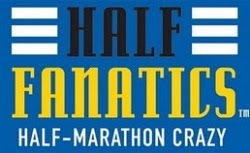 Do you have a finishing plan yet? Looking forward to the next update! It´s a beautiful design, so keep up the good work!!!! Thank you everyone! I'm going to make Foxy -- and his sibling UFOs, "Hare" and "Raven", into a set of cushions -- hopefully by the end of the summer if not before! Love the fox. He's gorgeous! I love William Morris’ designs and his ideas behind beauty and purpose. This is a really lovely piece, and I just love that Fox! so looking forward to seeing this piece progress!